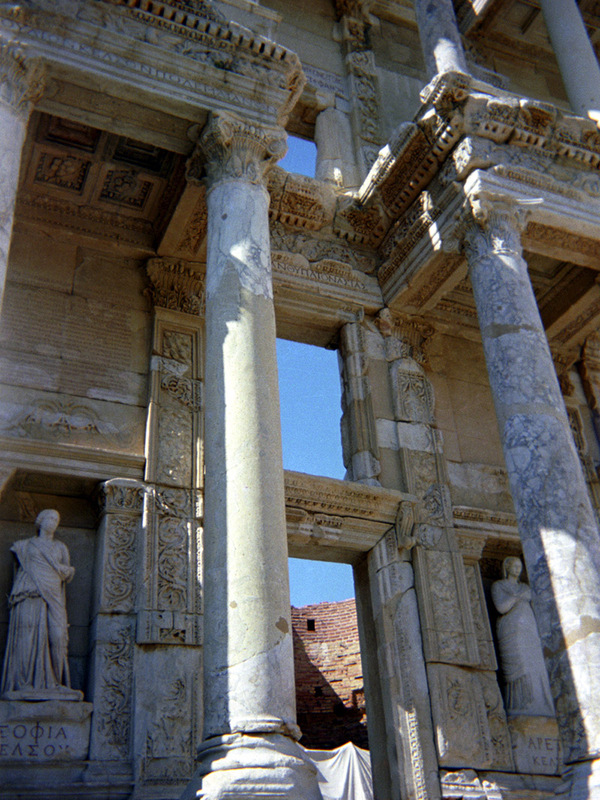 Turkey travel photos — Hey Brian? 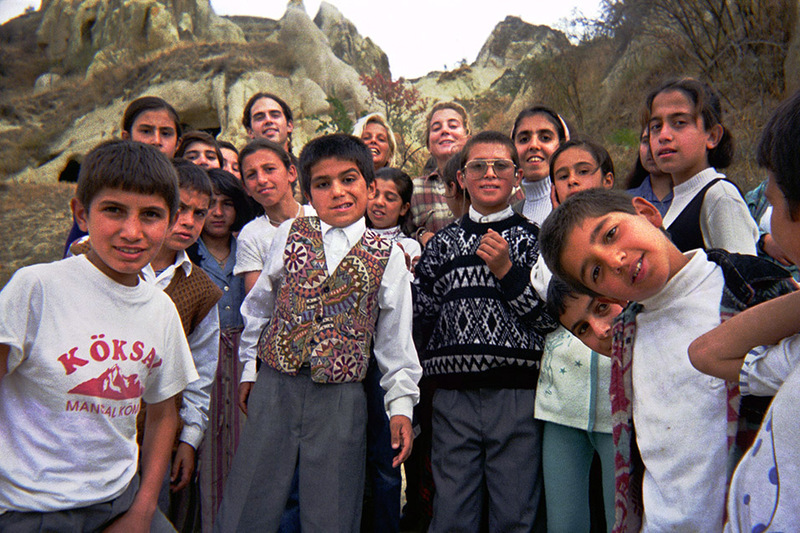 The only camera I took to Turkey was a plastic disposable Kodak point & shoot. The negatives have been poorly stored and are now scared with scratches, fingerprints and dust. Thankfully my Nikon 5000ED with Digital ICE4 came to the rescue. Please forgive the occasional glitch or scratch. Next time it’s going to be digital. This negative was scratched beyond belief. I once spent two hours trying to clean it and was still entirely unsatisfied. Thanks Nikon for helping restore this classic shot. I don’t remember where this picture was taken but it looks nice. 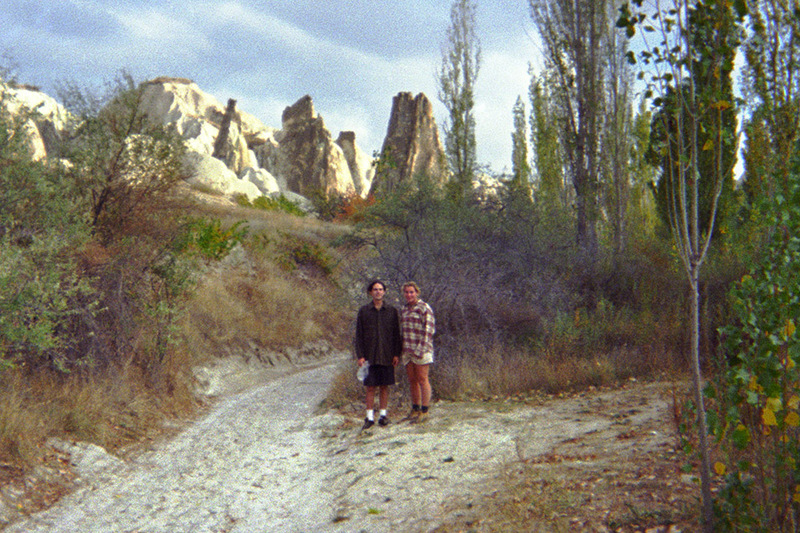 Hiking through Cappadocia is a psychedelic experience. There are giant mushroom-like rock formations everywhere and the ground has a spongy feel that gives a few millimeters every step you take. If you fell, it would be like falling on foam. There were little cottages and villages with locals growing grapes and places to picnic all over. I flew on an El Al 747 for the one-hour flight from Tel Aviv to Antalya. I had no US dollars when I arrived and, to my dismay, was required to pay for the $50 entry stamp in USD. To compound stress, there were no money changers or ATMs and a rather large sign above gave the stern warning that it was forbidden to change money in immmigration hall. Still I managed to find a hero who was willing to trade my Israeli shekel for USD. Lesson learned, always carry USD. When I exited the airport I realized I had no idea where to go and I had no guidebook. I instructed a taxi driver to take me downtown. I was dropped in front of a pension, perhaps his friend's, and for about $10 USD I bought a comfy room for the night. In the morning I wandered around town. I desperately needed a guidebook and found an outdated Lonely Planet that was selling for $40 USD. I happily paid the price for knowledge; suddenly I knew what to do and where to go. 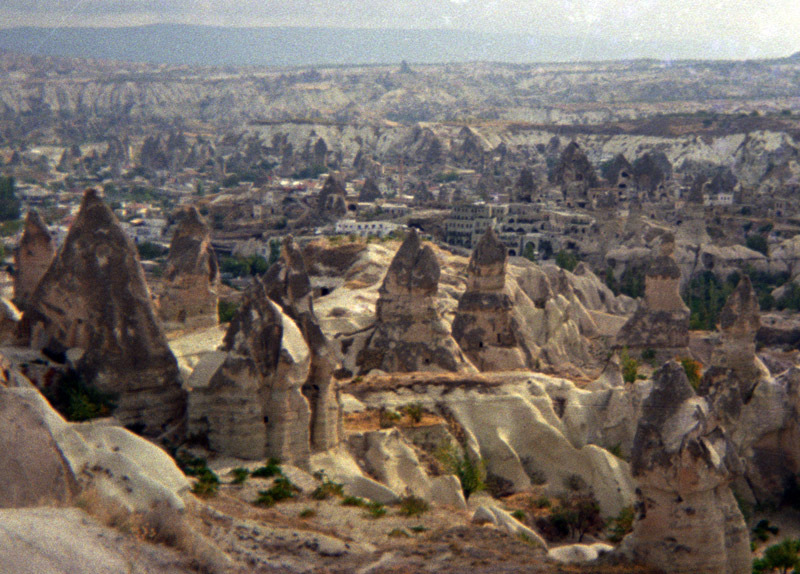 Later in the afternoon I boarded an all night bus for Cappadocia. Everyone on the bus is smoking, chatting and watching the bus movie. About an hour after we leave, the yardımcı, or attendant, walks down the ailse serving buscuits, water and lemon cologne which I rub in my hair to help hide the smoke scent. Sometime around dawn the bus pulled to the side of the road in the middle of no where and we were dumped off. There were several taxis waiting to take our money and drop us in town. I found a nice guesthose that used caves as its room. I met two blonde British girls and we hiked around for the rest of the day. 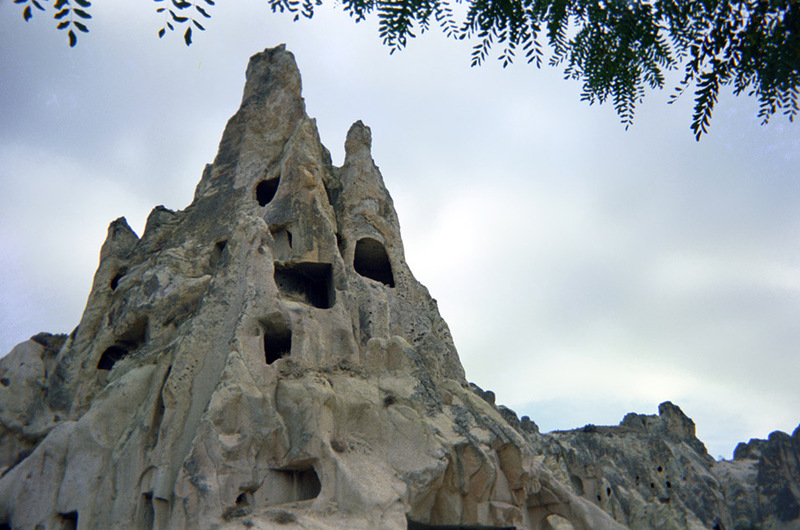 I join an all-day tour through the region which included Göreme panorama view, Derinkuyu underground city, Ihlara Valley Hiking, lunch, Yaprakhisar Panorama, Selime Monastry and Pigeon Valley. Afterward I booked an all-night bus with Nevtur Turizm to Istanbul for ₺900,000. 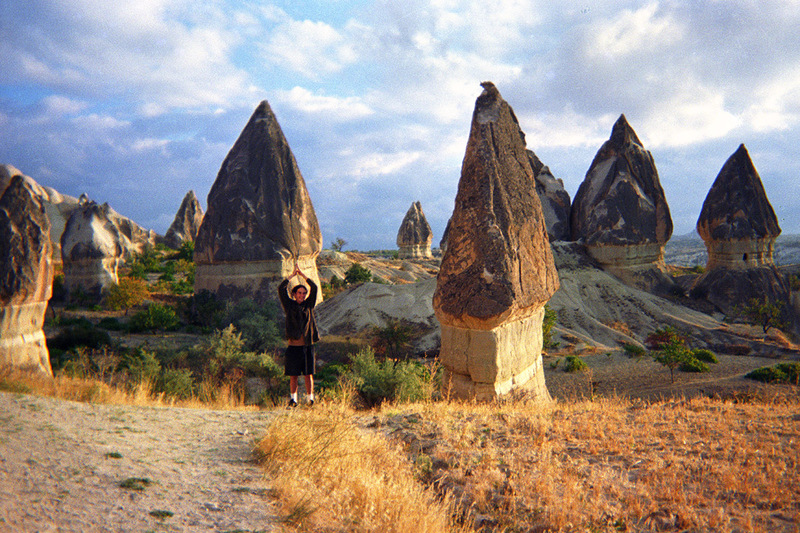 We leave Cappadocia at 6:30pm. I buy some cigarettes for the bus ride simply because everyone else on the bus will be smoking. After driving an hour, an attendant walks down the aisle offering snacks, drinks and the customary lemon cologne. I checked into a youth hostel in the historic Eminönü district. 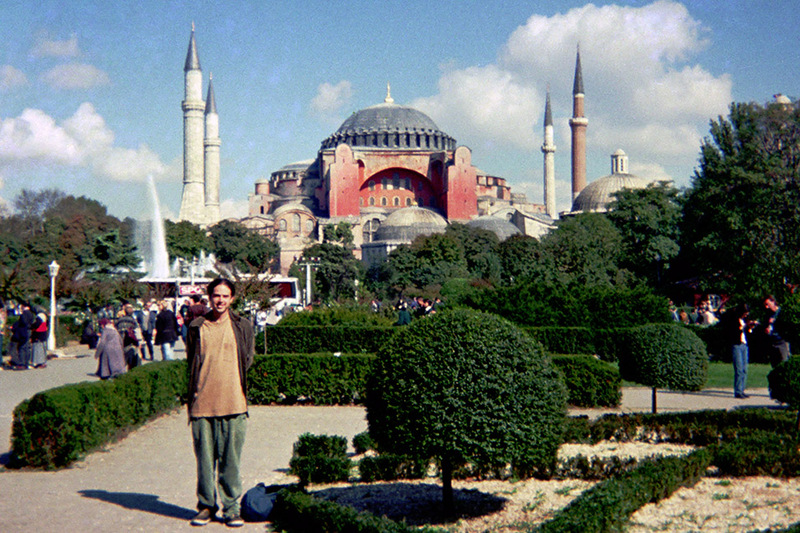 I tour the Topkapi Palace, Basilica Cistern, take an epic LP walking tour and discover an unrestored cistern. 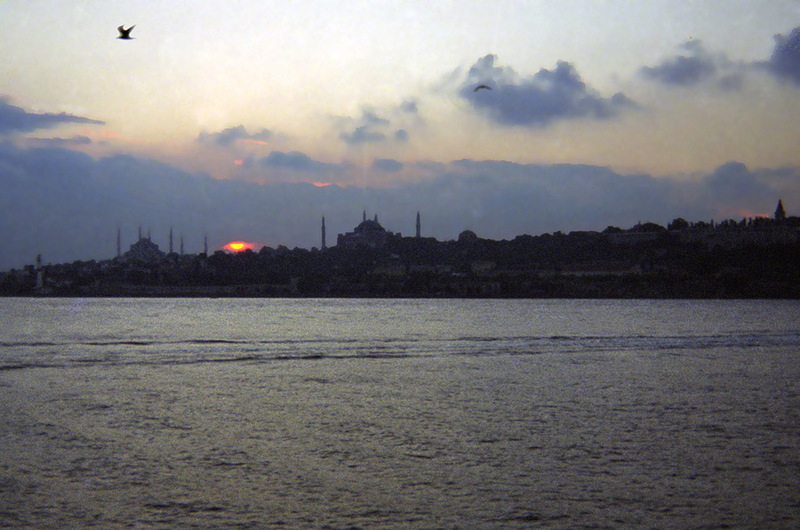 I board a passenger ferry and cruise up the Bosphorus to Sarıyer. I notice there are thousands of jellyfish in the ocean water. On the boat I run into a distant friend from my university, UC Santa Cruz. 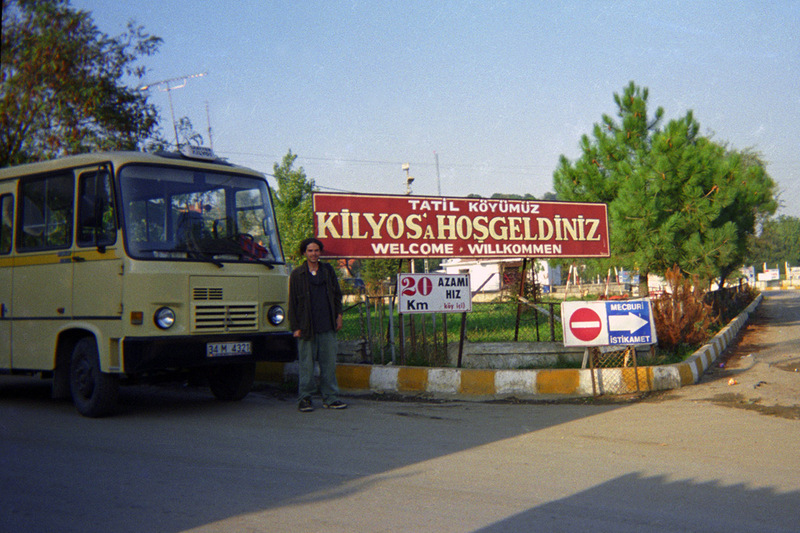 In Sarıyer I catch a dolmuş van and drive through the Belgrade Forest to the Black Sea resort town of Kilyos. Being October, there are very few tourists here. 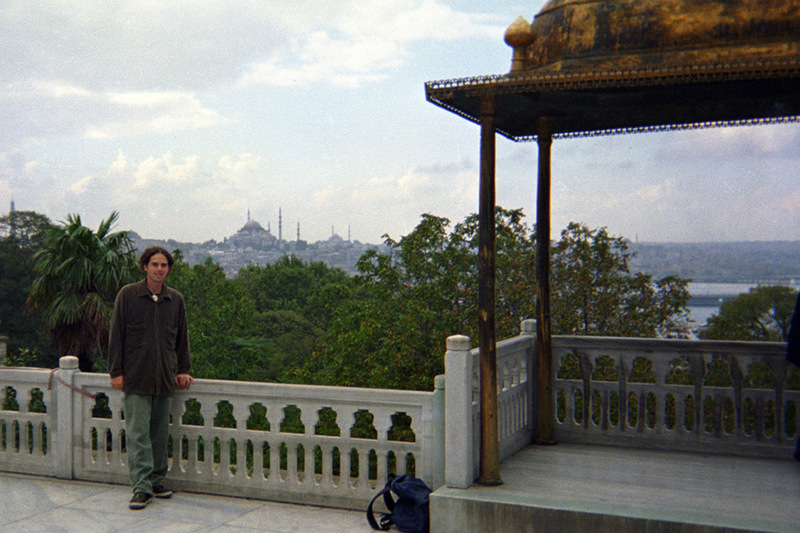 I grab a quick snack and soda and then head back to Istanbul the same way I arrived. I catch the 4:00pm bus to Izmir. We arrive at night and are dropped off in area with lots of seedy bars and hotels. It seems to be the gay district as guys are catcalling a fellow traveler and myself. I find a cheap room that is quite run down. The mattress has the worst sag I have ever experienced. 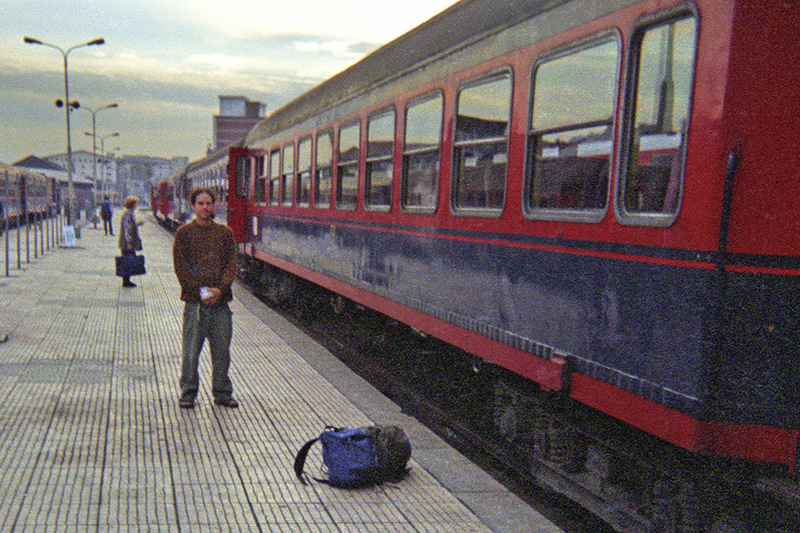 I catch the 7:00 AM train from Izmir to Selçuk. 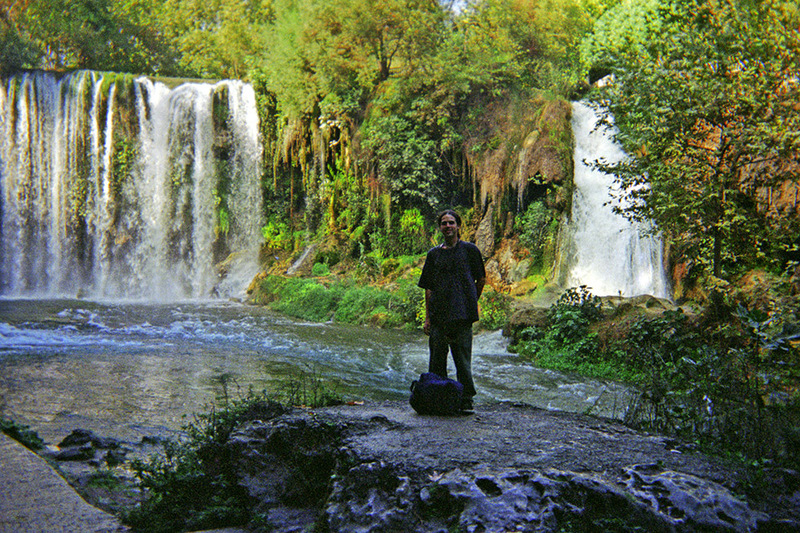 Denizli – I board a train from Selçuk to Denizli. It is an old train and the entry doors are left open. Some kids and I hang out in the area with the open doors and watch the beautiful countryside scenery roll by. The kids are dancing around the car, swinging in and out of the open door with the breeze blowing refreshing air throughout the compartment. After four hours my stop approaches. The train conductor speaks no English and I have a hard time understanding if his announcment is my stop. I suddenly realize getting off the train at the right stop is sometimes harder than getting on the train in the first place. 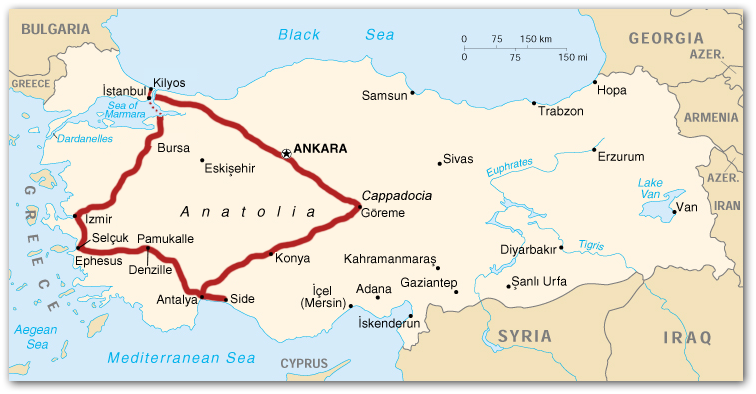 I confirm with several locals that the next stop is indeed my stop for Denizli. I get off the train with my backpack. Looking back, this was one of my favorite train rides of all time. I find a local hotel room and have my first experience with a flushable squatter toilet. I realize I have no idea what position to take while using the toilet. I try several methods but realize I have no idea how to use the damn thing. I walk around town, eat some food and have a terrible-tasting Tuborg beer. I climb the mineral baths of Pamukkale. You are still able to climb all over the mineral formation though I hear that next year toursits will be kept on a trail. I board and all-night bus to Side. We arrive to Side in the morning. I spend some time on the beach and visit a ruin. 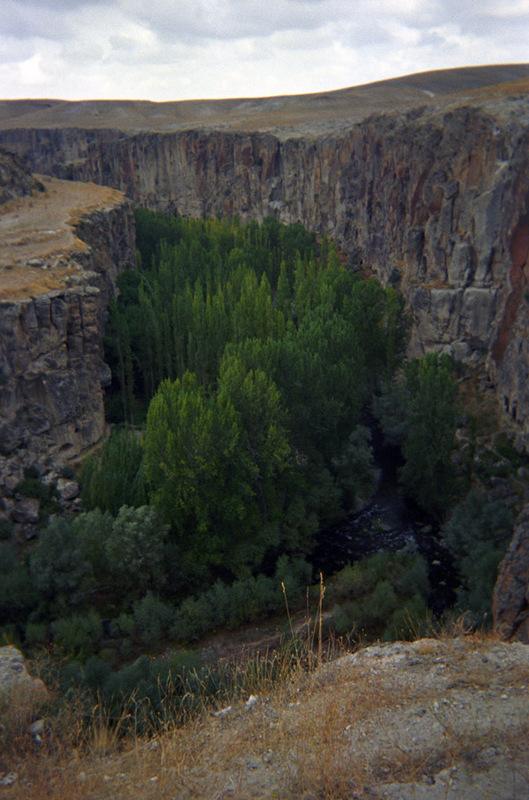 I take a bus back to Antalya and develop the pictures above from a one-hour photo place. I return to the airport, board my El Al flight, meet a cool fellow travel and together we fly back to Tel Aviv.